Ellen's grandson shows how it's done!! 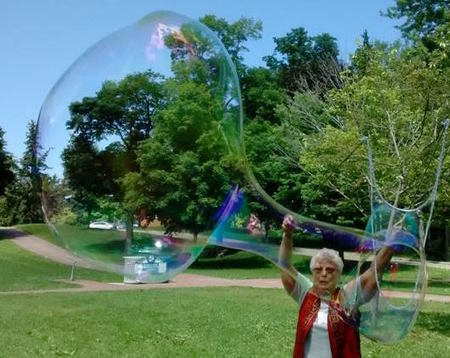 In 2015 we had Guelph's "bubble lady", Lynn as our guest at the outdoor June picnic meeting. Lynn introduced us to the magic and fun of bubbling. She shared her non-toxic bubble recipe. We were fascinated. Lynn went on to become part of the 4Gs presence at the August John Galt holiday street party, as part of the 4Gs market. Young and old were fascinated with the bubbles - with ooh and aah and requests for a chance to try. For 4Gs market volunteers, it was a natural sagwee into a conversation about the 4Gs and the Grandmothers' Campaign. We were impressed that all 40 bubble wands Lynn made, sold. Lynn donated the proceeds to the Grandmothers Campaign. Then Lynn offered to give over bubbling to 4Gs for our work of fundrasing and education. We bought all the materials and ingredients and Lynn joined us at outdoors workbees to show us how to make the wands, mix the best bubble recipe and tricks such as getting a bubble within a bubble. Bubbling at the August 2015 John Galt weekend celebration, fascinating young and old. Lynn's bubbles added fun and inspiration to our 4Gs June (2015 and 2016) picnic meeting. A beautiful sunny day to have a bubbling workbee in Royal City Park. Margaret, Lea Anne and Isobel hard at work. At $10.00 each - the careful work to build a strong wand is worth it. An opportunity to visit and support 4Gs fundraising efforts. Isobel, Sya & Peggi,sharing the fun of bubbling with a child. From Snap'd Sept 2016 "Mesmerized by a beautiful bubble"
10th anniversary celebration in August 2016. 4Gs were invited to share the party and set up a Market for Grandmothers Campaign. at John Galt holiday weekend Aug 2016.